I was raised in Charlotte, North Carolina by third generation entrepreneurs. Growing up on the East Coast my soul desire was to head West. Moving to California and starting my business is my greatest accomplishment thus far in life. My dream one day is to Franchise my company and see to it all critters have the options for fresh food every where. Now that our society is waking up to what we are feeding ourselves and our critters, I wake up everyday knowing my purpose. I love my life, my job and I really love all little critters. When Shinto, my dog was diagnosed with ovarian cancer and several other ailments at the age of 10, I was determined to do everything I could to prevent Shinto from being taken from me so early. Already well versed in nutrition and organic foods for the sake of my own lifestyle, I began researching the commercial foods I'd been feeding Shinto. Shocked by the contents, I began cooking my own food for Shinto, designed to alkalize her system and increase her white blood cell count. Shinto’s health returned and she lived for another six years. Inspired by my experience with Shinto, I went on to develop pet food formulas designed to bolster the health of pets. They now call me Pet Chef Lindsey. As the sole owner of Shinto’s Pet Food over the past 6 years, I have developed a holistic line of pet products geared to consumers who seek out the absolute best pet food for their animal. In 2016, we began renovation and construction to build the first Shinto’s Pet Food Kitchen in Grass Valley, CA. Currently we operate with four full-time employees, along with a Pet Chef, ME! We initially began launching Shinto’s at Farmers Markets throughout the Bay Area, including areas such as San Rafael, San Mateo, San Francisco and Berkley. We currently have our products in six retail locations, strategically aligned around our Farmers Markets to assure our clients have access to our products at all times. While word of mouth and selling our products at Farmers Markets allowed us to identify our target audience, we are looking to expand our production and our marketing efforts to reach a larger demographic. This loan, along with our freshly revamped facility will help feed hundreds of more critters and brand our product even stronger in the market to feed thousands more. Currently we are only able to produce 280 - 400 pounds of food a day. With a new mixer ($4000), new industrial blenders ($1000) and dehydrators ($1500) we could almost triple production. We would then allocate the remainder of the loan towards online and website marketing , to spread the word. After starting Shinto's Pet Food out of my home almost 6 years ago, this is our first year in a our new commercial facility. Having the proper gear and website our future is limitless. Why are you endorsing Lindsey? Lindsey is passionate about Shinto’s Pet Food and encouraging a holistic and organic way to bolster the health of pets. 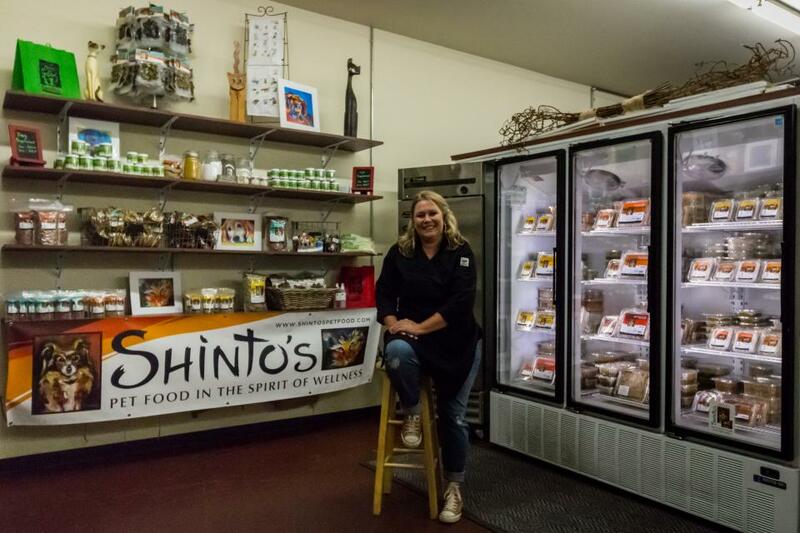 Lindsey is dedicated and has made Shinto’s Pet Food a number-one priority, striving to expand production and marketing efforts to allow pet owners to have access to food for their animals, free from the harmful contents of commercial packaged food. She also extends services to animals that need supplements or have specific illnesses. This determination to improve the lives of animals is also indicated through Lindsey’s work with nonprofits to help feed animals in the Bay Area. Shinto’s Pet Food traditionally takes around 8 hours to produce 440 pounds of food as everything is produced fresh, and frozen the same day the production process begins. Lindsey ensures that her customers have access to products at all times, and this strong work ethic is reflected in our interaction with her. Lindsey has a concrete vision for Shinto’s Pet Food and how she aims to use the funds from this loan, and was prompt and organized with the necessary documents that our due diligence process required. We are certain that Shinto’s Pet Food will be able to make timely repayments and engage with lenders. Microfinance at Berkeley is excited to endorse Lindsey for a Kiva Loan.